To say that Jarmere Jenkins comes from a tennis-playing family would definitely be an understatement. Jarmere comes from a family of nine tennis players, yet he has managed to make a name for himself and stand out on his own in the junior tennis world. Twelve year old Jarmere is currently ranked No. 5 in the nation in Boys' 12s. 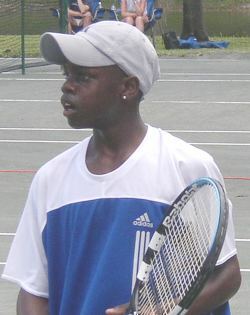 Though he had placed in a number of national events, last spring he took the age bracket by storm, winning the West Draw at the 2002 Super National Spring Championships, the Singles and Doubles titles at a National Open Championships a week later and then took fourth place at the Gator Bowl the week after that! Jarmere's winning streak carried on to the next month where he won the Peach State Classic. 2003 looks to be another terrific year for the Atlanta, Georgia, native. Jarmere won another National Open Championship before heading down to Florida for the USTA Super National Spring Championships. I sat down with Jarmere at that event just before he won the singles and doubles titles (with Rashaad Williams) in the Boys 12s. Q: Which tournament did you enjoy playing the most?